A concrete bird bath is one of the most common sighted in a garden, and for good reason. They’re easy to care for, simple in design, and resilient in all sorts of weather. So it's no surprise that our top overall choice for a bird bath is this 1-Tier Round Concrete version available from Lowes. This bird bath weighs about 100 pounds, but fortunately, the bowl and stand are in two pieces — making it more manageable to transport and move. Most people found it to be heavy, but possible to arrange it in their garden by moving each piece separately. Made from stained concrete, this bird bath is durable and will stand up to intense sunlight as well as colder temperatures. It’s easy to clean and has a wide, fairly shallow bowl that is inviting to most feathered friends. The color of the finish seems to vary somewhat, and that is the only complaint that some buyers have. Most people describe this bird bath as having a green hue, though a few have said that theirs is more of a bronze tone. Either way, it blends well into a variety of garden settings without stealing the show from the beauty of the flowers or birds. For a simple, low-maintenance bird bath, choose this 1-Tier Round Concrete Bird Bath from Lowes. A bird bath with a fountain can provide a pleasant sight and sound to your garden — and it may be more likely to attract birds, too! The Sunnydaze Beveled Flower Bird Bath Fountain is our top recommendation for a fountain bird bath. Featuring two round tiers with an overall height of 28 inches, this resin and fiberglass fountain has a submersible electric pump that quietly recirculates the water. You’ll need to plug this fountain into an outdoor electrical outlet to enjoy the stream of water trickling from the top tier to the lower tier. You will need to assemble this fountain bird bath when it arrives, but most people found this to be an easy task since the unit is primarily just two pieces. For the longevity of the fountain, it’s recommended to frequently clean the pump intake (some users simply tilt the top tier to empty the water, then spray the pump with a hose). During winter months, the manufacturer suggests emptying the fountain and storing it out of the elements or covering it. Overall, this fountain is a great choice that you and the birds will both enjoy! If you are looking for a bird bath with a fountain powered by the sun, the Solar Chatsworth Two-Tier Bird Bath is a top choice for functionality and classic styling. This bird bath sets itself apart from many other solar-powered versions with a battery that will store energy from the sun when the unit is off. While many solar-powered bird baths require direct sunlight to power the fountain, this bird bath can operate even on a cloudy day or in the evening by running on the stored energy in the battery. This offers you more options on when you (and the birds) can enjoy the pleasing sounds from this fountain bird bath. According to users, you can expect about 3 hours of fountain operation from a charged battery. While this may sound like a short window, you can turn the fountain on and off to decide when you’d like to use the stored solar energy to operate the fountain. The bird bath has two round tiers and is made from glass-reinforced concrete with a bronze finish. It weighs about 25 pounds. It’s recommended that you store this birdbath fountain during winter months for the longevity of the product. You also may need to clean out the pump periodically, which is true of just about any fountain bird bath. For a solar-powered bird bath, the Chatsworth Two-Tier Bird Bath is a smart choice thanks to its built-in battery and on-demand operation. A cast metal bird bath offers the durability and sturdiness of metal, combined with a classic look and easy maintenance. The Verdi Grey Frog Bird Bath by Oakland Living is a great choice for a metal bird bath. 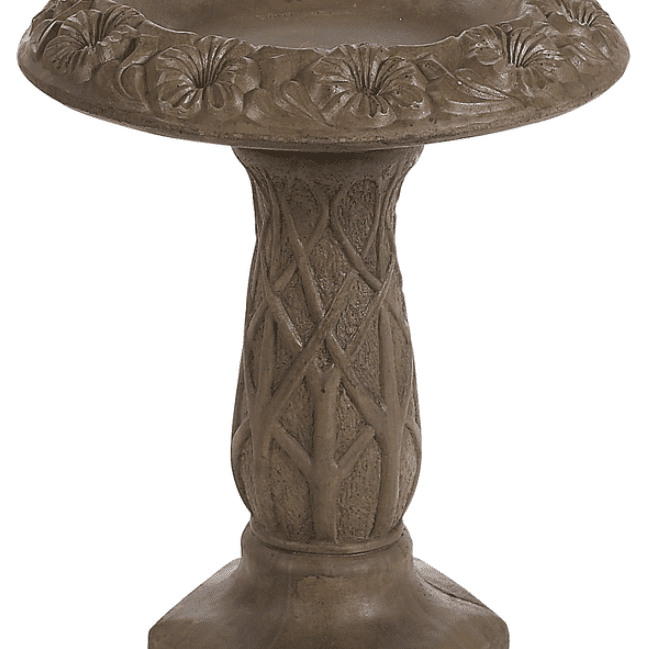 This birdbath features a cast iron base, topped with an aluminum bowl that won’t rust. But don’t worry – at 28.7 pounds, this bird bath is still light enough for most people to move around. This ​bird bath has a simple design with a touch of whimsy, thanks to the small metal frog perched on the edge of the bowl. Users point out that the addition of the frog is actually a functional piece since some birds like to sit on the frog to preen or dry off after using the bird bath. However, a few people had trouble getting the frog attachment to secure onto the bowl. Assembly in general for the bird bath may take a little ingenuity. While it is not overly complicated thanks to the simple 2-piece construction, a few users found that the holes did not initially line up. Turning the bowl on the stand below until a better alignment was found helped some people. Others had to purchase longer screws to resolve assembly problems. Once assembled, though, people love this cast metal bird bath, and report that birds do too! It is shallow enough to be accessible to most feathered visitors and is sturdy enough to stay upright in the garden with windy or rainy conditions. A hanging bird bath provides a safe spot for birds to bathe or get a drink — out of the reach of many predators and pests. The ACHLA Crackle Hanging Bird Bath is a popular choice for this category. This glass bowl and rust-resistant chain can be easily hung from a garden hook to provide a simple spot for birds to refresh themselves. The crackled glass provides visual interest but is easy to clean and resists mold and mildew. One thing to note is that it may be a little too deep for smaller birds, some suggest putting a few flat stones in the bottom to give birds a place to perch. While the glass is easy to maintain, be aware that it may crack if ​it has water in it and temperatures fall below freezing. 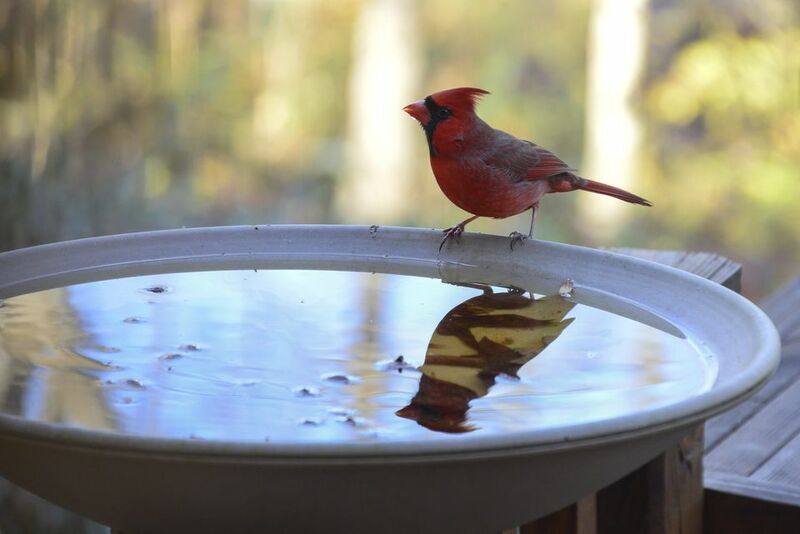 It’s recommended that you empty the bird bath during cold weather. If you want to host a bird bath all year-long, you might want to consider a heated version that will keep the water from becoming a giant ice cube, like this version from API. API’s heated bird bath is simple in design and has a crack-resistant bowl with a gradual incline that makes it easy for birds to wade into. A thermostat monitors the water temperature, and an integrated heater will assist to keep the water temperature between 40 and 50 degrees. If you live in a winter climate, this bird bath is an easy way to play host to a variety of birds all year long. A few people have noted that the legs may be a little difficult to balance or require extra anchoring, but in general this bird bath has worked well even in chilly climates. For a budget-friendly bird bath that will give your winged visitors a place to be refreshed, the Gardman Pedestal Bird Bath is an affordable choice. This resin-composite bird bath is lightweight and easy to move. It stands 28 inches high and has a bronze-look finish. Because this bird bath is so lightweight, you’ll likely want to add weight to the stand or base. The stand can be filled with sand or water on the inside, or the base can be staked down. Some users recommend using more heavy-duty stakes than the ones included with the purchase of this bird bath. Once assembled and in place, the Gardman Pedestal Bird Bath seems to attract birds easily and provides plenty of room for wading and drinking. However, this bird bath may not stand up to years of use. Some people reported issues with the resin cracking or the finish flaking. For the price, though, this affordable bird bath is a great way to make your garden an avian-friendly habitat on a budget.